Back to school the fairandfunky way! “Around this time last year, once again, it was my very special day! What to buy for a gal who doesn’t really value clothes, shoes or jewellery? Best to buy me something practical, functional; but quirky & fun. 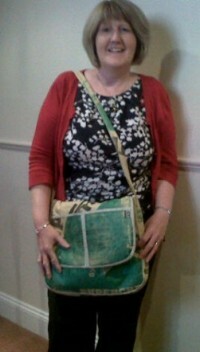 So when I got a laptop bag made from cement bags, bought for me by my teenage son, Alex I was, in fact, OVERJOYED! As a social media consultant I’m often found out & about in café‘s & hotel lobbies explaining the in’s & outs of LinkedIn, Twitter & Facebook to business people. I’ve lost count of the times I’ve heard someone asking me what the bag’s made of & where I got it from. And I’m always proud to tell them it’s made from recycled cement bags & I bought it from fairandfunky. In fact only this week my latest client said how much he admired the bag & for a change he knew it was made from cement bags. How did he know? He said he’d carried enough when working on a recent garden project to know a cement bag when he saw one! You too could love this bag! It’s available in red, blue and green and if you use code BACKTOSCHOOL on checkout you will receive FREE P&P.